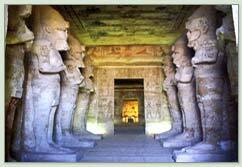 The Temples of Abu Simbel are two huge rock temples in Nubia. They are situated on the western bank of Lake Nasser, and are approximately a 300 kms road trip from Aswan. 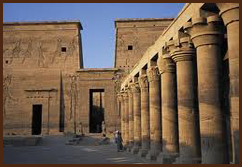 It was during the reign of Ramses II in the 13th century BC that these majestic structures were built. One main purpose of these monuments was to reaffirm the fact that Nubia belonged to the Egyptian Empire. The Great Temple has four colossal statues carved out of the rock with Ramses II seated , and on either side of the Pharaoh are princes, princesses and Queen Nefertari, much smaller and standing. The second monument is dedicated to the goddess Hathor, and so named the Temple of Hathor, and was built by Ramses in honour of his most favoured wife, Nefertari. The Temples of Abu Simbel would have been completey submerged by the building of the Aswan Dam, had they not been moved in 1968, stone by stone, to their new site 280 kms south of Aswan. 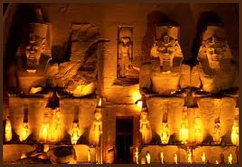 Abu Simbel is undoubtedly one of Egypt's top tourist attractions. The quarries of ancient Egypt were located in Aswan, and were noted for their stone, especially the granite rock. These quarries supplied the massive statues, huge shrines and also the obelisks of Egypt. The pyramids were also built from rock transported down the Nile from Aswan. Also nearby is the Philae Temple which was dismantled and transferred, stone by stone, before the waters from the Aswan High dam inundated the site. Each and every one of those stones was then replaced in its new location.